Pure Bio's high strength CBD oil is pure CBD infused in cold-pressed hemp oil, with nothing else added. The bottle contains 1000mg (1ml) pure CBD infused in 9ml cold pressed hemp oil. 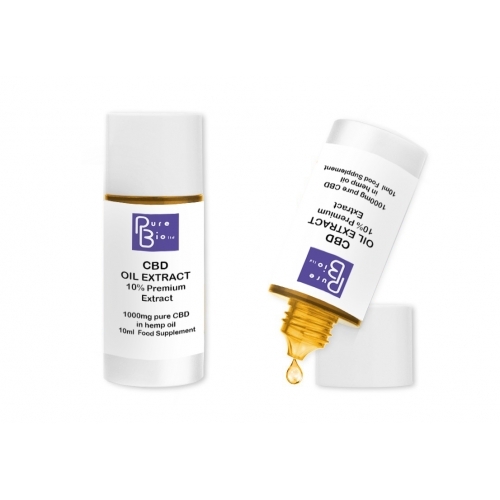 Pure Bio CBD Oil is provided in a unique ‘easy-dropper’ bottle which is guaranteed to release one drop at a time, with a simple push of the button. Remove lid, place the tip of the bottle under the tongue and push the button once to release each drop. Store in a cool and dark place out of reach and sight of children. Once opened, consume within six months. Due to no long-term research being available yet, it remains uncertain as to whether CDB oil may interact with other medication. If you are pregnant or lactating, have any health condition or are taking any medication, consult a practitioner before use.